The eclectic Note To Self range from Disaster Designs features a pin-board collage of colours and patterns. The main colours are cream and black, with gold backing to many of the items. 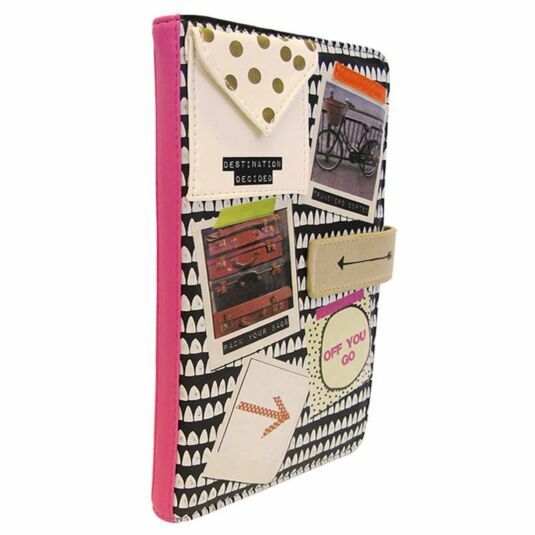 Polka dots, chevrons and random patterns are combined with imagery and blocks of bright colour to create the effect of a notebook or scrapbook of ideas. There’s a place for absolutely everything in this mega-useful Travel Wallet. Not only uber-practical, it also combines all the design elements of this inspiring modern range. 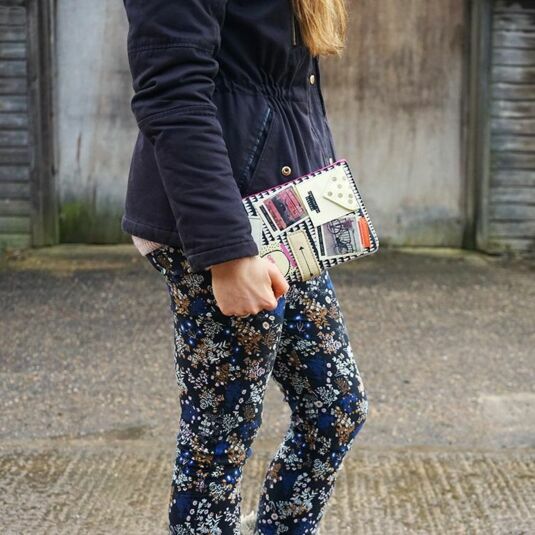 The front is black faux leather with a cream serrated print of standing stones. Collaged onto this background are travel images of a bike and a stack of vintage suitcases in the form of fake polaroid photos. Additionally, there are two pretend post-it notes, one with a polka-dot arrow, the other with the message ‘off you go’. There is also an appliqued pocket in cream faux leather, with gold polka-dots on the flap, and the words DESTINATION DECIDED in label-maker lettering on the front. 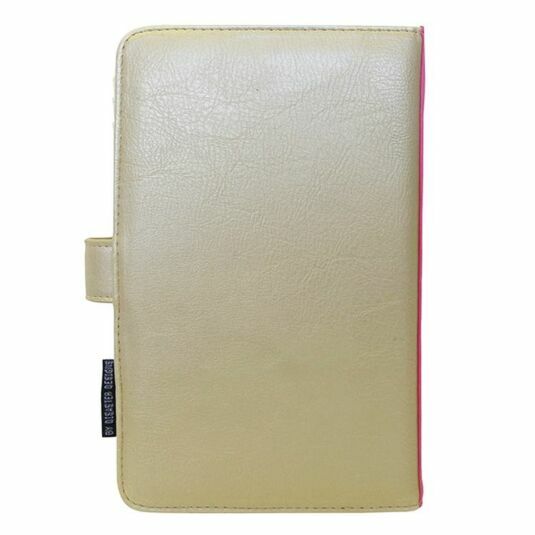 The back of the wallet and the closing press-stud tab are of gold faux-leather and pink trim completes the exterior. Internally, there are no less than eight credit-card pockets, plus a further pocket with a transparent plastic window for photos, tickets, memorabilia etc. Behind the credit card pockets are four full length cotton pockets, two edged in gold faux leather, the other two edged in pink and orange. The edgings have the words: HOTEL, DOCUMENTS, TICKETS AND CURRENCY printed on them in label-maker lettering, so there is no excuse for being disorganised! The chevron-printed lining is a feature of the interior, as is the pink trim, and patterned backings of cream with black squares and black with cream triangles. These belong respectively to the clear plastic-fronted passport pocket and the zip-closed coin pocket – both labelled of course! The passport pocket is open for swift access; the coin-pocket zipper has a decorative metal arrow attached to the pull. The final detail is a pen-holder (also labelled) – the designers at Disaster have really thought of everything on this wallet! 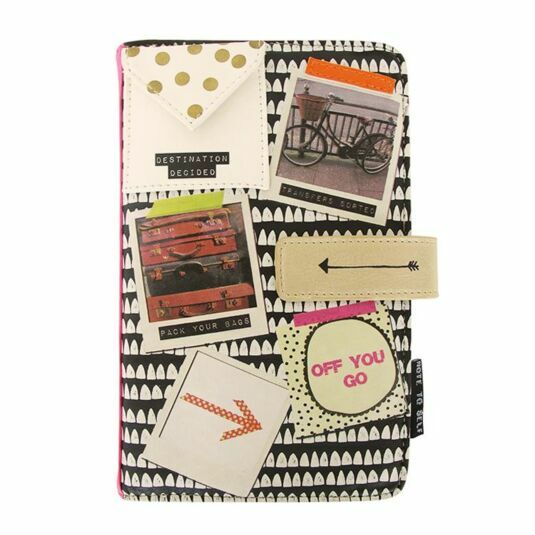 You won’t lose anything important on your travels with this ultra-organised and colourfully designed travel wallet. Those who love to organise and those who need to be organised will benefit from this colourful and practical item, from traveller teens to getaway grannies.